David is one of those guys that takes every session, every set of exercises and every repetition seriously. He forces me to be at the top of my game with planning and cueing and he lives a life that makes the things we do in the gym super real and important. At 73 he is still active skiing, rock climbing, gardening and living a busy work life. His energy for those pursuits is no doubt, in many ways, related to the efforts he makes to keep himself healthy and strong and I’m so happy and honored to have been a part of that for the past 4 years. Length of time with Hyatt Training and date when you started: I started in October of 2015, nearly three and a half years ago. What were your goals when you started? I wanted to stop injuring myself. For almost 30 years I had been experiencing a series of seemingly random injuries of joints and muscles. I know it was almost 30 years because I perfectly remember the first time I threw out my back lifting my infant daughter out of the bathtub, and she is now 29. I say random, because many of the injuries seemed to be precipitated by even more benign events than that—like leaning over to tie my shoes, for example. After one particularly painful and debilitating injury based on a fairly benign activity, it occurred to me that the problem was muscle strength. Specifically, I think I spent my entire adult life in a body in which the muscle strength was not as good as my general level of flexibility or conditioning. What has been your biggest challenge? Was there anything you had to overcome? No. It has been surprisingly easy and satisfying (except for the Airdyne). What have been your biggest areas of improvement? I don’t ever remember being as strong as I am now. What is your favorite thing about Hyatt Training? The space – emotionally, physically, interpersonally. What is your favorite thing about your personal trainer? I enjoy the time together, and I trust him with my life and health. What is your proudest achievement or biggest accomplishment since you began working with Hyatt Training: Probably my overall level of strength and fitness. Although if you really want me to name one thing, it would probably be the successful assault on Beacon Rock. My daughter created an episode of our adventure on her Dirtbag Diaries podcast sponsored by Patagonia. 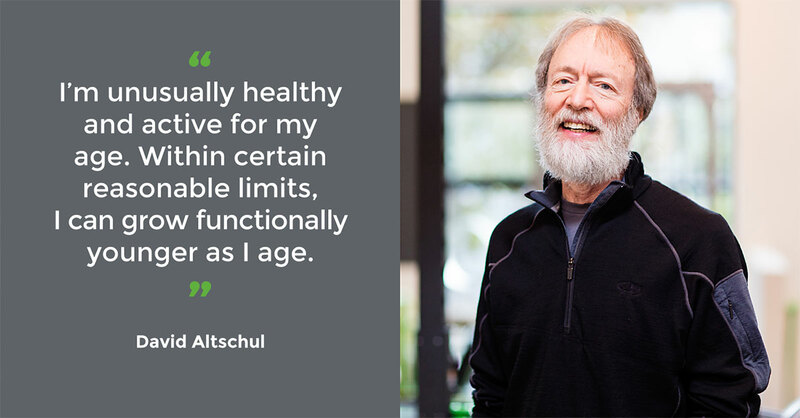 What have you learned: Within certain reasonable limits, I can grow functionally younger as I age. What advice would you give to other people starting on their fitness journey? Less bread and more alcohol.